Today’s post is by 3Q Digital Search Account Coordinator (and Excel whiz) Spencer Fair. You can catch 3Q Digital’s expert search marketers on the Bruce Clay, Inc. blog every other month, and we on theirs, in our ongoing search blog partnership. Now, let’s get to some advice on advanced Excel reporting. 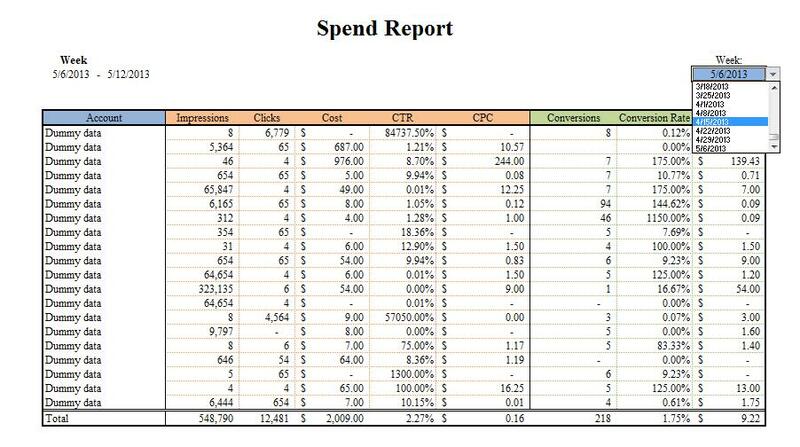 There are many useful Excel tips for PPC out there and even more general Excel help forums offering all sorts of suggestions for formulas, reference sites, etc. It’s all great stuff, but one of the things I’ve had trouble finding lots of info on is reporting templates for pay per click campaigns. Hurts your eyeballs, doesn’t it? This thing is beautiful, no? One formula that is undervalued/underused is the =if(_,_,_) formula. When it is used, it is usually in its most basic form (a yes or no formula). It is commonly used as a checker formula – but why not use it for more with the help of some other formulas? This searches in the campaign name for brand; if it finds it, it will return Brand, and if it doesn’t, it will return Non-Brand. This still only returns two values (yes or no), so why not use it for more? This formula wraps “if” statements inside “if” statements to allow you to get more than a yes or no response. It allows you to fully parse out data you have embedded in campaign names, etc. (using naming conventions), which is a very powerful tool if you are trying to build out an automated report that just uses data you downloaded from Google. Leveraging these formulas in a raw data sheet, you can parse out a vast number of funnels for you to filter the data, allowing for a much better view into the account for both you and your client. Understanding that you can put formulas inside other formulas you use on a regular basis opens a whole new world of data manipulation. For example, you can use a vlookup inside a vlookup to dynamically/automatically adjust which column of data is pulled. How do you leverage all these formulas parsing out segments and calculating data on a raw data sheet into something professional with drop-down menus that adjust the data? If you set a Named range to a table, the range will auto-adjust as you add or remove data from the table. This is why the raw sheet is built in a table. This formula helps to prevent large amounts of blanks from appearing in the data validation (drop-down) menu. These formulas are a good start when it comes to building report templates that can be used across clients/accounts; they will definitely help in making production and reporting more efficient, manageable and consistent on a larger scale. For even more Excel tips and tricks, I recommend Chandoo, a site that provides tips, tutorials, examples and downloads for Excel. Have questions? Leave them in the comments. Or, call BCI for PPC services to help manage your ad campaigns. Spencer Fair is a search account coordinator at 3QDigital and an Excel whiz that saves his colleagues many (many) hours of Excel-wrangling time. Thank you so much for such a nice tutorial. I learnt many new things here. Keep it up. Wow! This has everything that a person planning to build an SEO business must have. Even the templates are already good enough for reports that you will try to complete in your years in the business. This is not as detailed as it can get but it is surely a piece of a gem. Great article with some really useful tips at a time of year when everyone should be milking their PPC campaigns for all their worth! Great article. Excel is the thing that I need the most help in and this helped alot. Thanks for the tips.